This control is used for make-up air and space heating. The discharge temperature of the heater remains constant as selected on the selection dial. The burner flame is modulated by a discharge temperature control, which is governed by the remote temperature selector. FAN ON / BURNER ON mode:Heater can operate continuously for building exhaust air replacement and space heating by maintaining a constant discharge temperature. FAN ON / BURNER OFF mode:The blower can operate without the burner for summer ventilation. This control is used for make-up air and day/night heating of the building. The discharge temperature of the heater remains constant as selected on the selection dial. The burner flame is modulated by a discharge temperature control, which is governed by the remote temperature selector. AUTO / WINTER mode:Heater cycles on/off to maintain space temperature as selected on the thermostat. ON / WINTER mode:Heater can operate continuously for building exhaust air replacement and space heating by maintaining a constant discharge temperature. ON / SUMMER mode:The blower can operate without the burner for summer ventilation. This control is used for make-up air and total automatic "day/night" heating of the building. 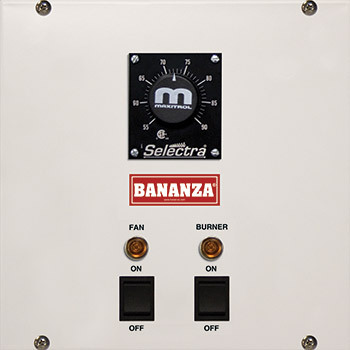 A solid-state modulating room Selectrastat fully modulates the burner flame to maintain space temperature and compensate for changing building heat losses or gains. AUTO / WINTER mode:Occupied time: Heater can operate continuously fully modulating Btu/h output to maintain space temperature as selected on the Selectrastat. Unoccupied time: Heater cycles on/off to maintain space temperature as selected on the programmable thermostat (night setback). ON / WINTER mode:Heater can operate continuously fully modulating Btu/h output to maintain space temperature as selected on the Selectrastat. 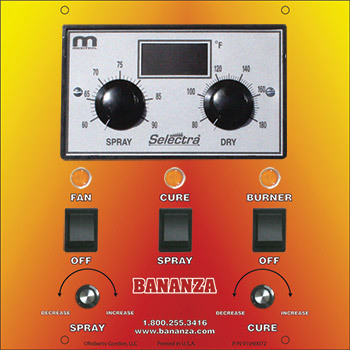 This control is used for spraying paint with discharge air temperature from 55°F to 90°F. 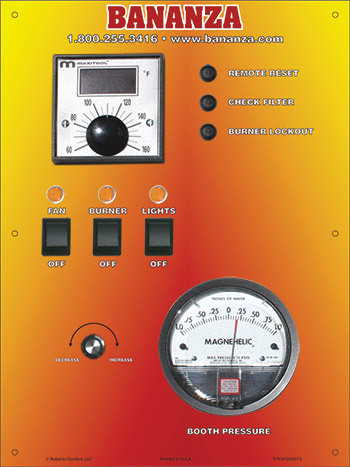 Discharge temperature of heater remains constant as selected on temperature selection dial. Burner flame is modulated by discharge temperature control, which is governed by remote temperature selector. ON/OFF switch for booth lights. FAN ON / BURNER ON mode:Heater operates continuously, supplying make-up air and maintaining a constant discharge temperature. FAN ON / BURNER OFF mode:Blower can operate without burner for cool down. 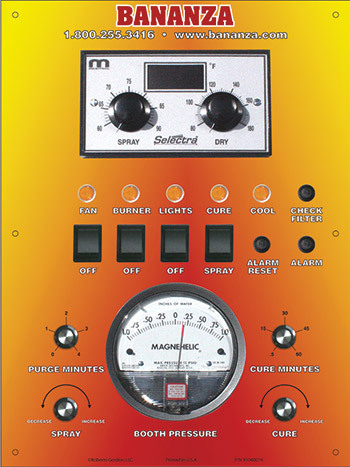 This control is used for curing paint with discharge air temperature from 120°F to 170°F. Discharge temperature of the heater remains constant as selected on temperature selection dial. Burner flame is modulated by discharge temperature control, which is governed by remote temperature selector. ON/OFF switch for booth lights. 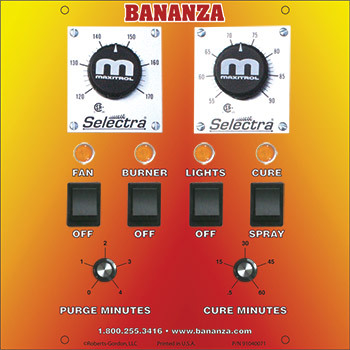 This control system incorporates ON/OFF switches and indicator lights for fan, burner and booth lights; SPRAY-CURE™ mode selector switch and indicator light; two discharge temperature selection dials (55°F-90°F and 120°F-170°F); adjustable timers for PURGE and CURE cycle and cure interlock relay. SPRAY-CURE™ Selector switched to CURE mode:PURGE timer (adjustable) is energized. CURE timer (adjustable) is energized. BOOTH LIGHTS turn off. Temperature control switches to CURE selector (120°F-170°F). 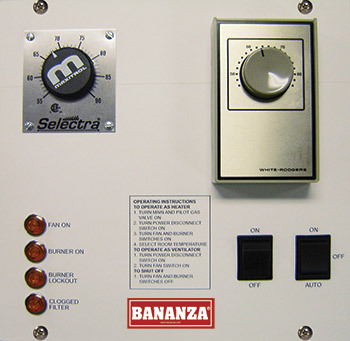 Burner modulates maintaining a constant discharge temperature. COOL down timer (preset) is energized. BOOTH LIGHTS turn ON. Temperature control switches to SPRAY selector (55°F-90°F). Burner modulates maintaining a constant discharge temperature. Heater turns off. 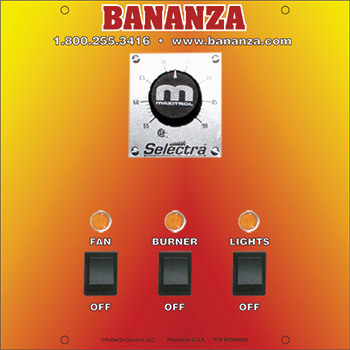 This control system incorporates ON/OFF switches and indicator lights for fan and burner; SPRAY-CURE™ mode selector switch and indicator light; two discharge temperature selection dials (60°F-90°F and 80°F-180°F) with digital display; adjustable speed controls for exhaust fan in spray and cure mode and cure interlock relay. FAN / BURNER ON - SPRAY mode:Heater operates continuously, supplying make-up air. Burner modulates maintaining a constant discharge temperature (60°F-90°F). Spray speed pots adjusts booth pressure. FAN / BURNER ON - CURE mode:Temperature control switches to CURE selector (80°F-180°F). Burner modulates maintaining a constant discharge temperature. Cure speed pot adjusts booth pressure. 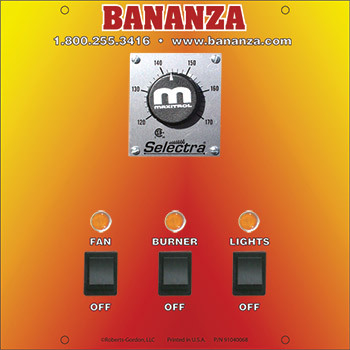 This control system incorporates ON/OFF switches and indicator lights for fan, burner and booth lights; discharge temperature selection dial (60°F-160°F) with digital display; adjustable speed control for exhaust fan and booth pressure gauge. Optional items include burner lockout and check filter indicator light and remote reset push button. FAN / BURNER / BOOTH LIGHT ON mode: Heater operates continuously, supplying make-up air. Burner modulates maintaining a constant discharge temperature (60°F-160°F). The booth pressure can be adjusted via the speed pit and observed on the pressure gauge. 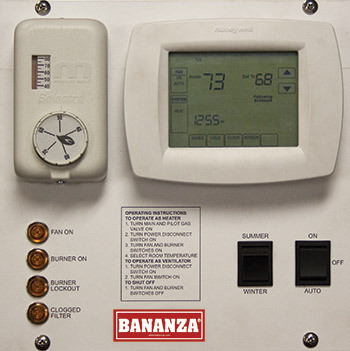 This control system incorporates ON/OFF switches and indicator lights for fan, burner and booth lights; SPRAY-CURE™ mode selector switch and indicator light; tow discharge temperature selection dials (60°F-90°F and 80°F-180°F) with digital display; adjustable timers for PURGE and CURE cycle; adjustable cool down timer; adjustable speed controls for exhaust fan in spray and cure mode; booth pressure gauge and cure interlock relay. Optional items include burner lockout and check filter indicator light and remote reset push button. FAN / BURNER / BOOTH LIGHT ON - SPRAY mode:Heater operates continuously, supplying make-up air. Burner modulates maintaining a constant discharge temperature (60°F-90°F). Spray speed pot adjusts booth pressure. SPRAY-CURE™ Selector Switched to CURE mode:PURGE timer (adjustable) is energized. CURE timer (adjustable) is energized. BOOTH LIGHTS turn OFF. Temperature control switches to CURE selector (80°F-180°F). Burner modulates maintaining a constant discharge temperature. Cure speed pot adjusts booth pressure. COOL down timer (preset) is energized. BOOTH LIGHTS turn ON. Temperature control switches to SPRAY selector (60°F-90°F). Burner modulates maintaining a constant discharge temperature. Spray speed pot adjusts booth pressure. Heater turns off.